The stock price of Boeing company, as suggested by our analysts, soared, making it possible to earn a very good money for investors and traders who is using our tips. Shares rushed up and held steady even at resistance level of $ 150 per share. Now the price for the shares was halted near the major resistance level of 150.80, where the price was about a year ago. The optimism of investors is amplified by news that the company Aerospace Québec is likely to win the contract associated with the federal government, and will buy 18 Boeing Co Super Hornets. The Government of Canada announced that they begin negotiations and would soon acquire these aircraft to replace its aging fleet of fighter jets. Boeing said that also they strive to provide Canadian companies contracts as a result of the transaction. Canada intends to buy 18 planes at once, as opposed to putting in their rent, or with the provision of share repurchase. It is also worth mentioning that these events coincide with the general rise in stock prices of the stock market. Total stock traders bullish sentiment may help budge the stock price and Boeing. Given that these stocks have a good reserve in the chart, the investors profit can be multiple many times, compared with investments in other sectoral indices and stocks. 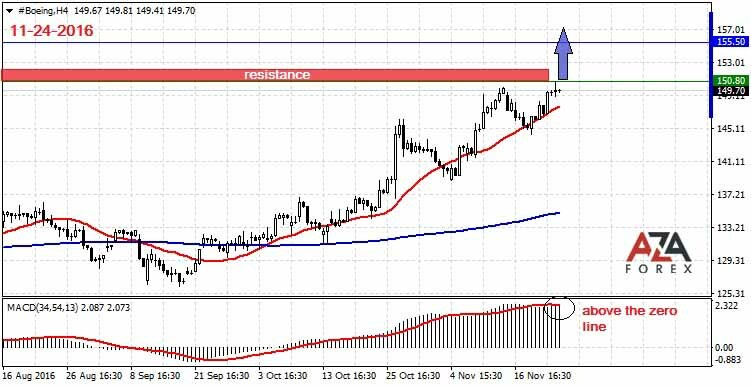 Therefore, as soon as the price of shares exceeds the level of 150.80, we open a long position with the target of 400 points to the next resistance level.